It’s another beautiful day here in Boston. And according to local brand, Life is Good, each one of us has a choice –– to focus our energy on either obstacles or opportunities. After all, we can choose to dwell on what’s wrong in the world, or we can build on what’s right. And, whatever we choose to focus on grows. So, let’s focus on the good and join Life is Good by celebrating the Heroes of Optimism who teach us to cherish the simple pleasures in life every day. When you honor your hero of optimism by submitting your story, you’ll be doing good for kids, too! Life is Good is calling for entries to recognize everyday heroes who help others grow the good in their lives. 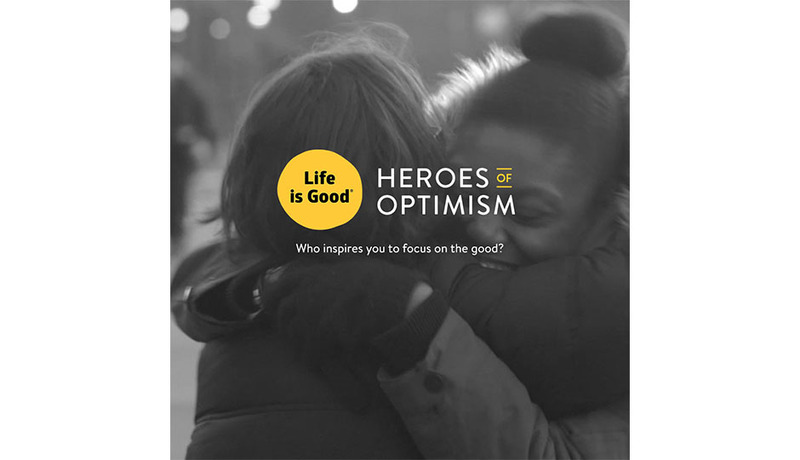 For each hero honored, Life is Good will donate $1 to support childcare professionals who are heroes of optimism for kids in need thanks to the Life is Good Kids Foundation. “My dad is my hero. He fights ALS every day with a smile on his face. He has lost the ability to speak and has a difficult time swallowing but every day he gets up and gets ready for the day. I am a single mom and he helps pick up the kids even when he doesn’t feel the best. He is the most positive and motivated man I know.” – Brandi T.
“My 12-year-old daughter, Emma. She is a type 1 diabetic with celiac disease. Her hair has fallen out in patches and kids at school bully her constantly. And yet this kid is the toughest and kindest soul I’ve ever met. She is loving and compassionate and giving to everyone. With all that she has to deal with, she still finds a way to lift up others. She’s amazing!” – Julie H.
My husband is my hero. He has been amazing this last year. I was diagnosed with Multiple Sclerosis and have a lot of bad days and he is always there for me. My hero may be doing the laundry, cooking dinner, giving kids a bath, going to the grocery, or just listening to my worries. He is always supportive and positive. We have been married 19 years and I couldn’t have asked for a better friend, lover, father for my kids, or hero! – Jennifer G.
“My rescue dog Roxie. She is from a kill shelter in Bluefield, West Virginia. She was adopted and ended up in the shelter twice. She ended up in Hamilton, NJ and our five-year-old rescue had just passed away from cancer. When we saw Roxann’s face we knew she was a forever member of our family. She has been through some major health issues but we have a great vet, Plumstead Animal Hospital, and we are able to manage everything. Looking at what this precious fuzzy girl has been through reminds me we can never give up hope and all good will come. Roxann Bradley the rescue dog is my hero.”- Ann B. Keep the good vibes going. Honor your hero of optimism now! Tell us about your hero of optimism and how they inspire you to focus on the good in your life! Then, opt-in to optimism and follow Life is Good on Facebook, Twitter, Instagram, Pinterest, and YouTube as more stories of optimism are shared each day.